A seven-year-old girl with Down syndrome was incidentally found to have abnormal chest radiograph finding. She had no history of fever, dyspnea, hemoptysis, or features of upper airway obstruction. There was no significant family history or contact with tuberculosis. Oxygen saturation in room air was 97%. Normal vesicular breath sounds were heard bilaterally on examination of the chest. Her chest radiograph [Figure 1] and computed tomography [Figure 2 and 3] of the chest are given below. Subpleural cysts of Down syndrome. Figure 1: Chest radiograph of a seven-year-old girl, anteroposterior view. 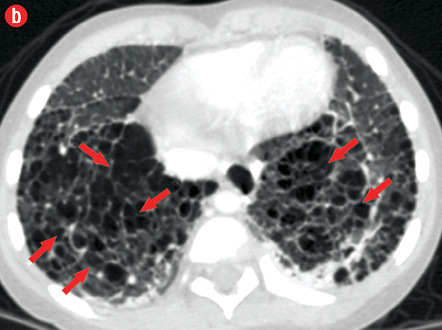 Chest radiograph showed hyperinflated lungs with bilateral diffuse reticulonodular interstitial opacities and small cystic lucencies [Figure 1, arrows] in the lung bases. 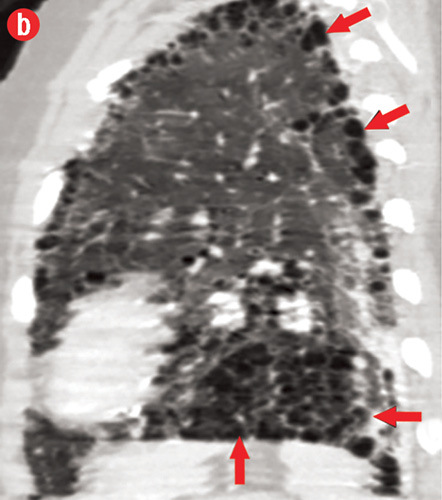 Computed tomography (CT) of the lungs showed multiple air filled cystic lucencies [Figure 2 and 3, arrows] in both lungs with a subpleural and basal predominant distribution. These findings were consistent with subpleural cysts of Down syndrome. Subpleural cysts are small cystic dilatations along the subpleural surface of the lung. The first association of this finding with Down syndrome was reported in 1986 in two infants who were found to have cystic lung disease on autopsy.1 Gonzalez et al,2 reported a prevalence of 20% in an autopsy series of 98 patients with Down syndrome. Biko et al,3 found a prevalence of 36% in a review of the CT scans of 25 children with Down syndrome. Figure 2: Axial computed tomography images of the chest at the level of (a) upper lobes and (b) lower lobes. 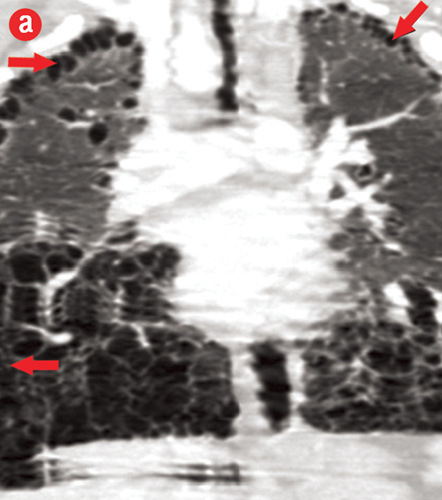 Figure 3: (a) Coronal and (b) sagittal computed tomography images of chest. 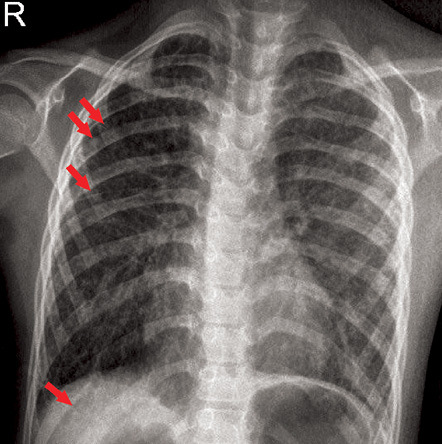 Subpleural cysts are common finding in Down syndrome, which may be incidentally noted on CT scan images, but rarely can be seen on chest radiograph. These cystic spaces are secondary to the hypoplasia of the lung in Down syndrome and further diagnostic work-up is not routinely needed. Joshi VV, Kasznica J, Ali Khan MA, Amato JJ, Levine OR. 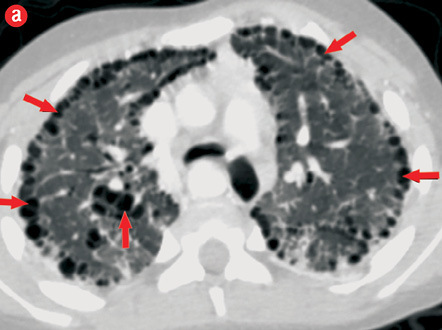 Cystic lung disease in Down’s syndrome: a report of two cases. Pediatr Pathol 1986;5(1):79-86. Gonzalez OR, Gomez IG, Recalde AL, Landing BH. Postnatal development of the cystic lung lesion of Down syndrome: suggestion that the cause is reduced formation of peripheral air spaces. Pediatr Pathol 1991 Jul-Aug;11(4):623-633. Biko DM, Schwartz M, Anupindi SA, Altes TA. Subpleural lung cysts in Down syndrome: prevalence and association with coexisting diagnoses. Pediatr Radiol 2008 Mar;38(3):280-284. Cooney TP, Thurlbeck WM. Pulmonary hypoplasia in Down’s syndrome. N Engl J Med 1982 Nov;307(19):1170-1173. Gyves-Ray K, Kirchner S, Stein S, Heller R, Hernanz-Schulman M. Cystic lung disease in Down syndrome.Pediatr Radiol 1994;24(2):137-138. Abbott GF, Rosado-de-Christenson ML, Franks TJ, Frazier AA, Galvin JR. From the archives of the AFIP: pulmonary Langerhans cell histiocytosis. Radiographics 2004 May-Jun;24(3):821-841. McDowell KM, Craven DI. Pulmonary complications of Down syndrome during childhood. J Pediatr 2011 Feb;158(2):319-325.